The 2017 Grammy Awards had some awesome moments and incredible performances, and was overall great to watch. 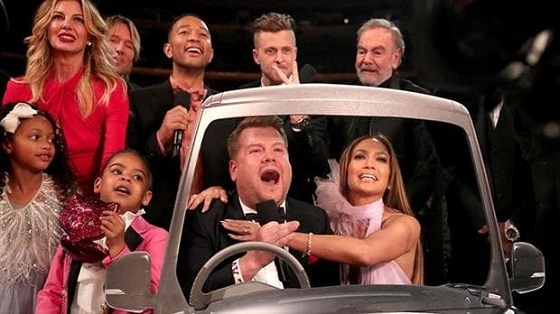 Hosted by James Corden, it was definitely music's biggest night, filled with its share of downfalls, of course, but the good outweighed the bad. Watch some of the top moments below! I love this guy! He can be a tiny cheesy at times, but overall he's really funny and cool. This rap was a great kickoff to the show, and I hope to see him come back as the host next year! Chance took home quite a few Grammys in a history year where the award show began accepting digitally streamed albums. As an indie artist, Chance has had incredible impact, and he gave God all the glory, and kept on going even when the Grammys tried to cut him off! Of course, there's no question that Bey would make this list! The woman is pregnant with twins, and still managed to give an incredible performance of her songs "Love Drought" and "Sandcastles." It was filled with great visuals as well, and she was absolutely glowing as she clutched her baby bump throughout! I had vaguely heard of Maren before, knowing that she was a country singer. Man, she blew me away with this performance of her song "Once," with Alicia accompanying her! Maren's voice is so beautiful, and this track was truly moving. So much so that I flocked to iTunes to check her out right afterwards. This tribute, to me, was better than The Time and Bruno Mars' tribute for Prince. With Demi Lovato, Tori Kelly, and Little Big Town, this performance was electrifying and so much fun. And Demi's vocals and look?! Amazing! Adele had a HUGE night, winning some of the most coveted awards for her album 25, including Album of the Year. In her speech, though, she said that Bey was really the one who deserved it because of her work on Lemonade, which brought tears to Bey's eyes. It was a powerful moment, not because Adele was stanning, but because they clearly have so much love and respect for each other (um duet soon?!). BOTH of these women are incredible, and gave amazing us great pieces of work...both arguably the best of their careers. I honestly would've been happy either way. But the love and tears between them made me tear up myself.